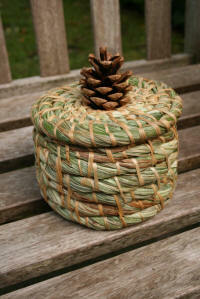 Coil basketry can be as simple or as ornate as you like. Techniques vary quite a lot between cultures, and according to material choice, but also how expedient you wish to make your bakset. 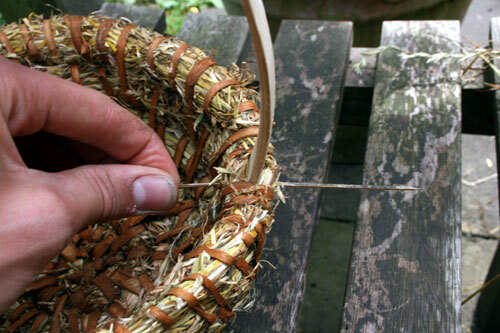 The basket I show you how to make in this article is simple kind which doesn't take too long to make and can be made at home or out in the woods. Such baskets would have been extremely useful and important to our ancestors; because the coiled structure is so tight these baskets are ideal for gathering, processing and storing seeds and berries. 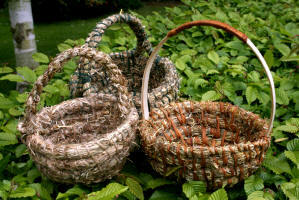 With the coiling technique you can make baskets of many shapes; vase shaped, bottle shaped, or wide bowl shaped... A quick internet image search for 'African coiled basketry' will reveal some extremely refined and admirable examples. 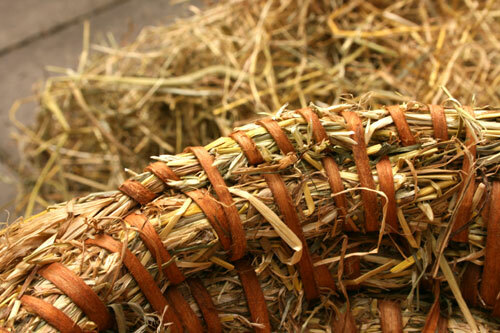 The possibilities for material choice are vast. I simply used hay and inner Elm bark for the basket featured in the tutorial below; as that is what I had to hand at the time. My favourite choice of material for the main core of fibres would be Rushes or Sedges, I particularly like to use the long fronds of Hard Rush or Pendulous Sedge. 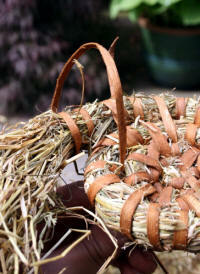 Pine needles, reeds and many types of grass can also be excellent. 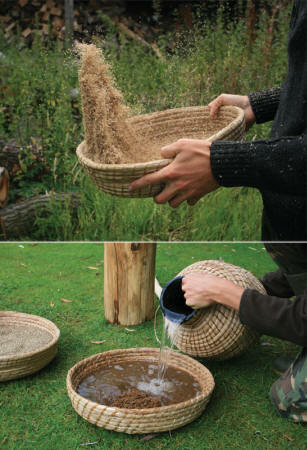 Whatever you choose, if the material is freshly cut from growing plants it's best to thoroughly dry it first. 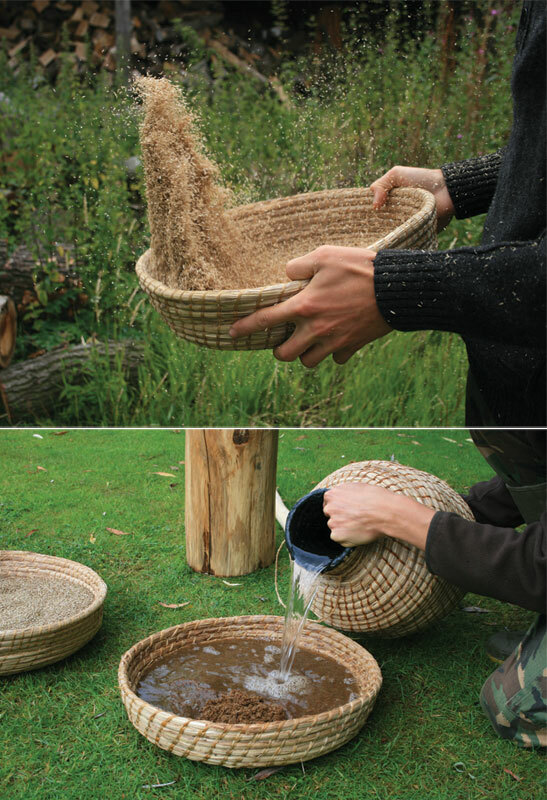 Organic materials shrink a lot the first time they dry out, so a basket made from fresh material will become all loose and poor in quality when it dries out later. 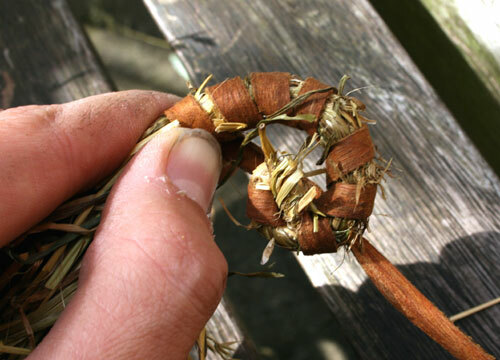 For the binding material (which is used to bind the layers of coils together) you could use flexible bark fibres such as that from Elm, Willow and Lime; Modern string is perfectly good too. 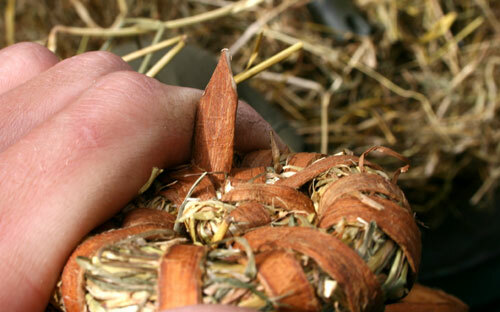 Begin to wrap the strip of bark around the core of hay for a few centimetres. 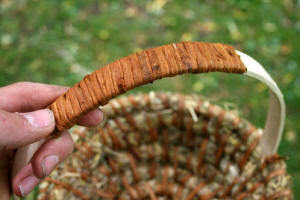 Gradually encourage this sausage of material to begin to spiral around. 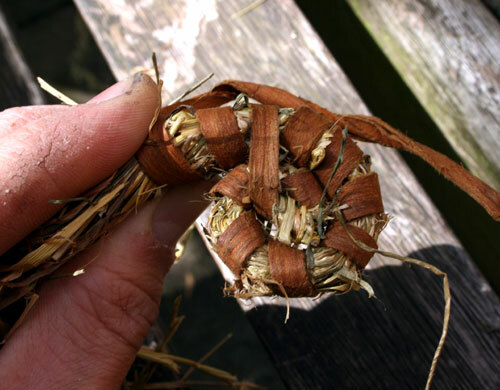 From now on every couple of wraps you make with your binding material, take the end and thread it under and around the previous layer of the coil. If you have trouble threading between the layers you can use an awl to separate the fibres. 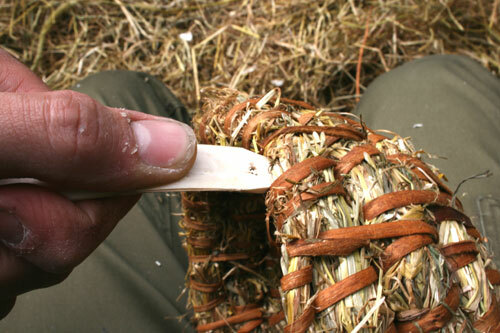 With a fairly tough binding material like this Elm bark you can point the end with your knife to make it easier to thread between the layers. For a softer binding material such as string I like to whittle a large wooden needle and use this for threading. 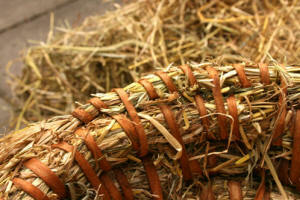 You will need to keep adding hay into your fibre core to keep it an even thickness. The thickness of the coil is up to you. When your bark strip is about to run out you can weave/ thread the end down between the coils to lock it in place. You can introduce new binding material by doing the same but outwards towards the edge. It won’t be long before your basket has grown to a usable size. 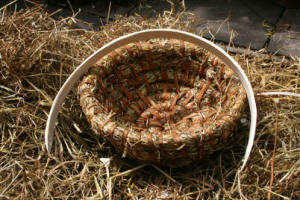 You can make a basket as big or small as you like with walls as steep or gradual as necessary depending on your needs. When you are happy with the size of your basket stop adding in as much hay and eventually stop altogether so that core of fibres tapers off. You can make handles from various materials. 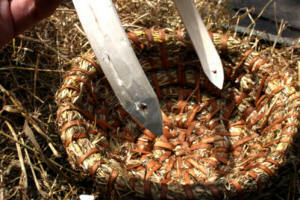 A wooden handle is rigid and strong which maybe suitable for your needs. 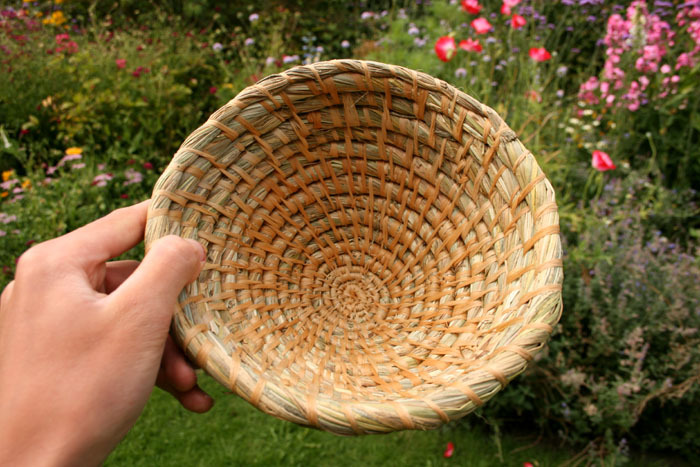 The design or use of a basket may mean that a handle is not required. 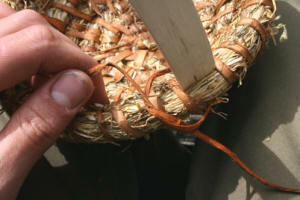 Push the ends of the handle into the warp making sure that the handle is central and straight. 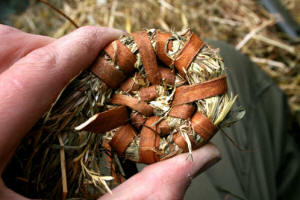 Now you will need to fix the handle in place, this is where the wholes come in handy. Push a thin stick or awl through the warp fibers and whole, and then out the other side to separate the fibers. 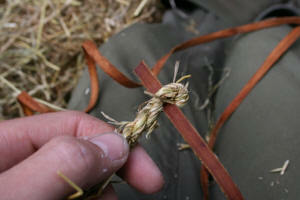 Now pass string through this passage and tie the handle in place. 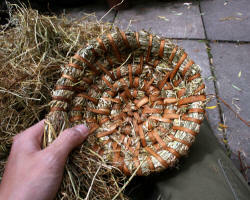 I decided to bind the top of the handle with bark to complete the basket. The two baskets shown here on the left were made with hay and modern string. They have rope handles which were made from hay too. 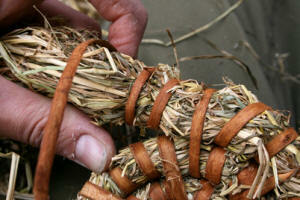 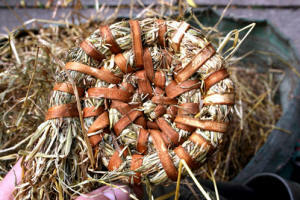 These baskets are made from Sedges and is bound with inner lime bark fibres. This one uses a pine cone as a handle on the lid.